This series was created during the very beginning of my blogging days. This was before thousands and millions visited and read and made the recipes from my blog. Because of this, the early recipes weren’t tested over and over to perfection like they are today. My plan is to go back and retest these recipes at some point this year. For now, I’m letting you know that this recipe isn’t the best representation of what you’ll find on Live Simply for recipes. My recipe testing and creation has come a long way since the beginning days of the blog. 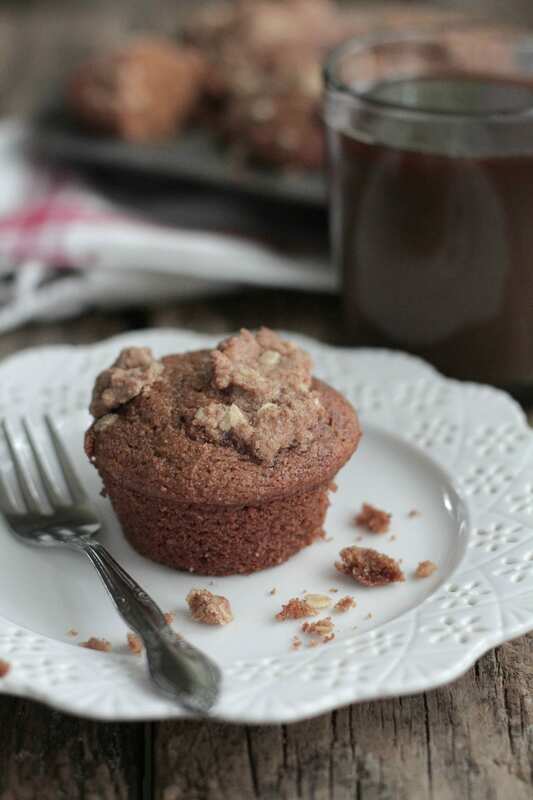 Want to make a tested and perfected baked good? Head over here for all my favorite recipes. Welcome to day one of Fall Baking University! Did you enjoy the rich chocolate cake yesterday? Okay, maybe the slice of chocolate cake covered in rich glaze was a little hook and bait to entice you to join me for these baking classes, but I promise you’re going to love every minute. If you missed yesterday, you can find the cake (there may still be a slice left), a baking video (it’s super cute! ), and the amazing syllabus and companies joining us right here. We’ll cover many different flours over the next six weeks, including gluten-free flours, but first we’re going to start with a whole grain that’s one of the simplest flours to start using in your real food kitchen, spelt. Spelt is believed to have originated in the Near East over 8,000 years ago, eventually making its way into Europe, particularly Germany. Spelt is a whole grain related to wheat, but performs very differently when used for baking. The mildly-nutty tasting spelt berry is considered an “ancient” grain much like einkorn (which we will discuss next week) and is even referenced in the Bible. This ancient title means the berry has not been hybridized like our common modern-day whole wheat. Spelt has a lower gluten content than today’s wheat, making it easier to digest. People with minor gluten sensitives can often consume spelt without the issues associated with whole wheat, however, spelt is not gluten-free and should not be used by those with celiac disease or a severe gluten intolerance. Why Should I Use Spelt Flour? Spelt flour is one of the easiest whole grain flours to start using for real food baking. In fact, when readers decide to switch from enriched white flour to a whole grain, spelt is my top recommendation. Spelt flour can easily be subbed for all-purpose white flour and can also be used in place of whole wheat flour. Spelt has a lower-gluten content than modern day wheat and also contains more protein. The spelt berry is water soluble (which is something that needs to be considered when baking) which means the nutrients are quickly absorbed by the body. Bob’s Red Mill Spelt is carefully selected and stone-ground, producing a flour that’s high in fiber and iron. How Can I Use Spelt Flour? 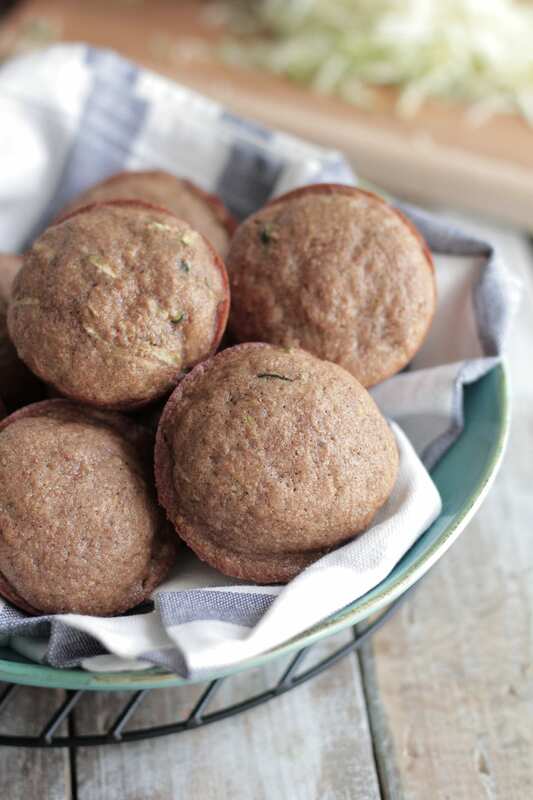 Spelt flour can easily be used in recipes calling for whole wheat or all-purpose white flour, particularly for quick breads (think non-yeast breads like banana bread), muffins, and cookies. 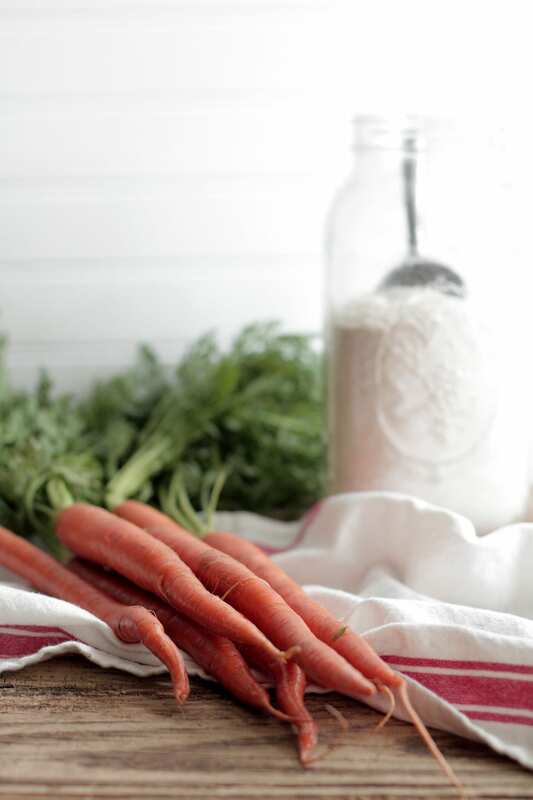 Due to spelt being water soluble, more liquid is often needed when converting a recipe. This simply means watching the dough or batter and adding a couple of extra tablespoons (or more) of liquid to prevent a dry baked good. So the next time you make muffins and the final product is too dry, remember, it’s because spelt is water soluble (absorbs liquid). Next baking session, simply increase the liquid in the recipe by a couple of tablespoons. When it comes to yeast breads and baking, it’s important to take into account the low-gluten content and more fragile characteristics of spelt. Spelt does not like to be over-mixed or over-kneaded. 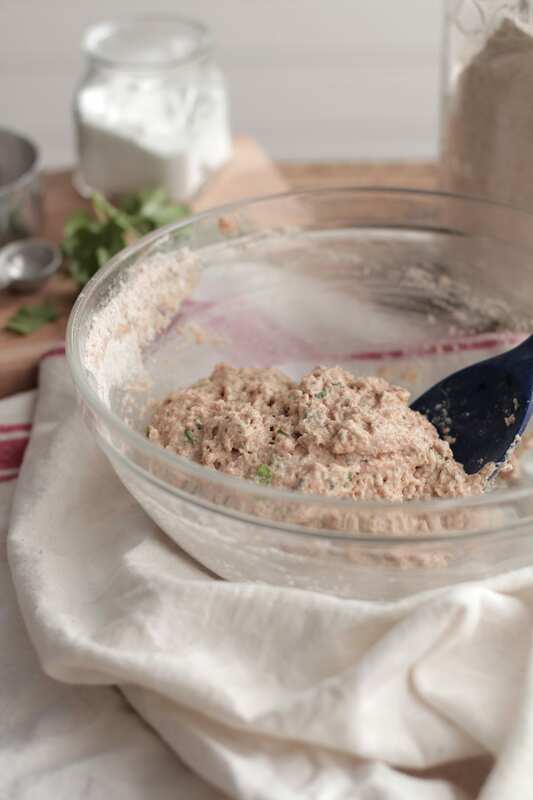 This means less kneading is often needed when converting a recipe that calls for whole wheat. 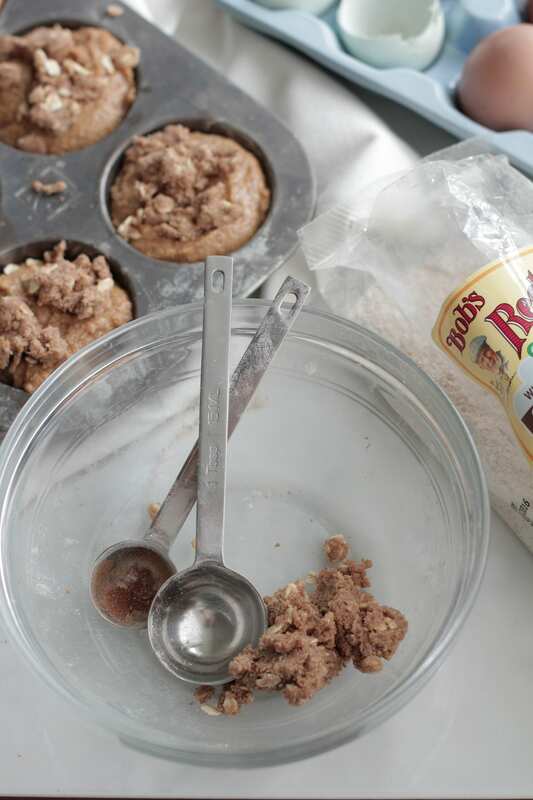 Over-working (too much mixing or kneading) will result in a final product that’s crumbly. How Do I Store Spelt Flour? Whole spelt berries have a longer shelf-life than spelt flour (ground berries) of approximately six months when stored in a cool, dry place. Spelt flour (ground berries) can be stored in a cool, dry place for one to three months or long-term in the freezer. Of course, flour and berries will keep much longer, but for freshness these are the guidelines I abide by in my kitchen. I purchase both Bob’s Red Mill spelt berries and stone-ground spelt flour. Grinding your own spelt berries can be expensive (requiring a grain mill) and time consuming, but gratifying. Spelt berries can be found online through Amazon and Bob’s Red Mill and locally at natural food stores. Spelt flour is becoming more popular as “real food” is more widely accepted. Many conventional grocery stores now carry spelt flour. Look for spelt flour that’s labeled “whole grain” (not “white” spelt flour) for real food baking. You can also purchase spelt flour from Amazon and Bob’s Red Mill. Are you feeling confident with spelt now? To get you started with this easy-to-use whole grain, I’ve compiled a few real food recipes that specifically call for spelt flour. Remember, you can also use spelt flour in your favorite recipes that call for all-purpose white flour or whole wheat, but you’ll want adjust the liquid by a couple of tablespoons (or more) to prevent a dry final product. Finally, before the bell rings and we part ways for today, let’s share in one last spelt recipe. Yes, this is technically a “baking” series, but whole grains like spelt can be used for so much more than just muffins or cookies from the oven. 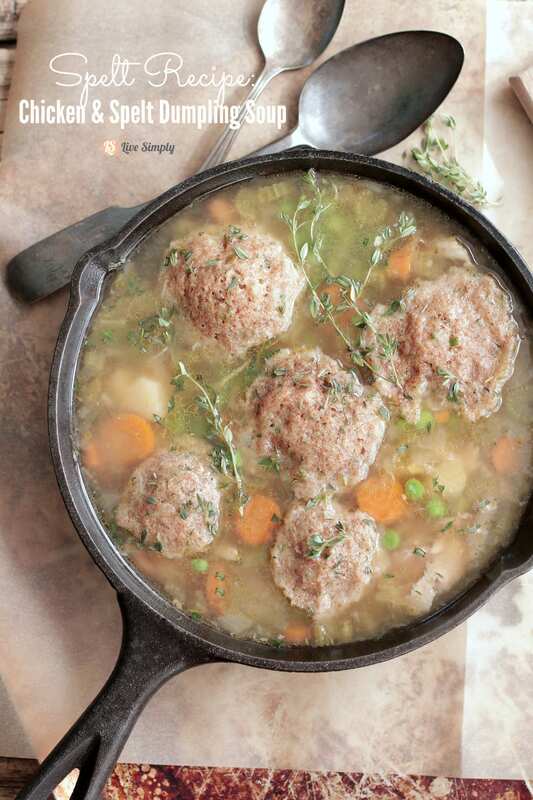 This recipe is a classic one-pot fall and winter soup topped with hearty spelt dumplings. Spelt dumplings are light, yet hearty and very easy to make for a spelt newbie. 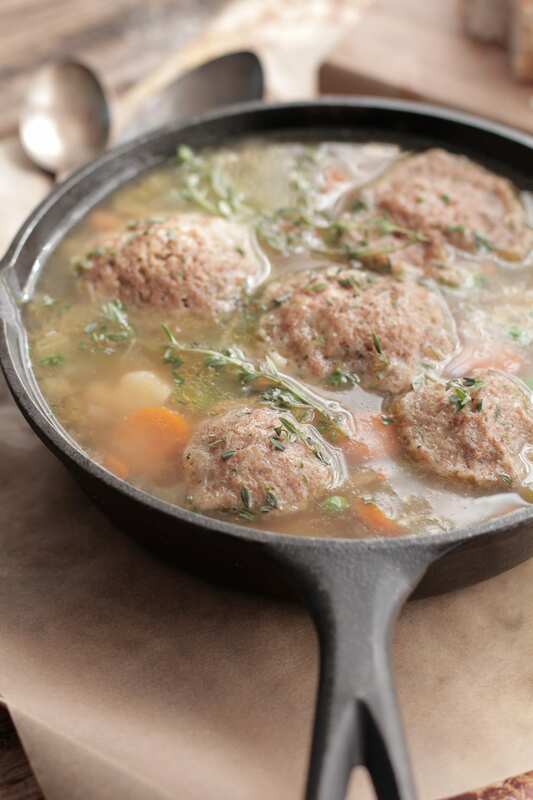 This recipe is a classic one-pot fall and winter soup topped with hearty spelt dumplings. Spelt dumplings are light, yet hearty and very easy to make for a spelt newbie. 3/4 cup buttermilk you can also use whole milk and 1 TB of lemon juice. Squeeze the lemon juice into the milk and allow to rest for 5 minutes. In a large soup pot, over medium-high heat, melt the butter. Add the carrots, celery, and onion. Stir the vegetables into the butter. Cook the vegetables until the onions are translucent (approximately 7-9 minutes). Add the garlic cloves and potato to the vegetables and cook for 1 minute. Add the thyme sprigs, bay leaf, salt, whole chicken, and chicken broth/water to the pot. Bring the soup to a boil, then reduce to a simmer. Cover and allow the soup to simmer for an hour to an hour and half (depending on the size of your chicken). The chicken is done cooking when the leg easily pulls away. Once the chicken and soup are cooked, carefully remove the whole chicken and place it on a large plate. Separate the meat from the bones. Remember to save the bones to make homemade broth. Return the meat back to the soup and add 1 cup of frozen peas. Allow the soup to simmer as you mix the dumpling dough. 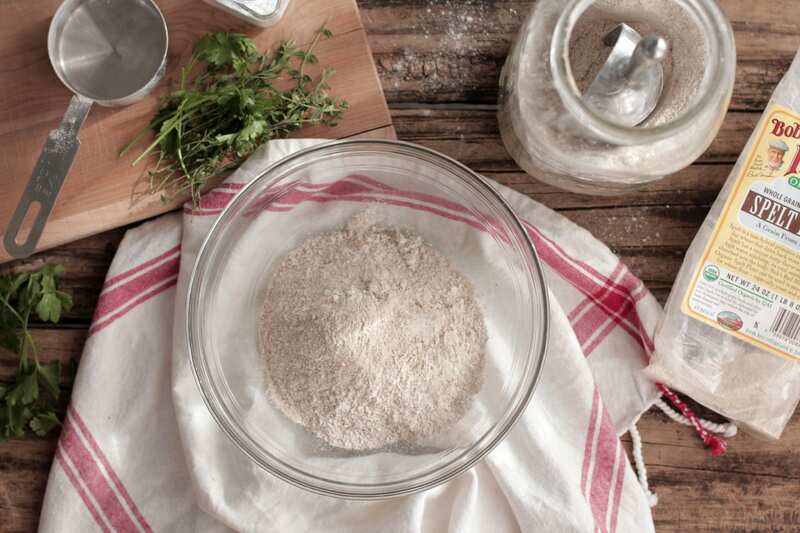 For the spelt dumplings, whisk together the spelt flour, fresh herbs, baking soda, garlic powder, and salt. Pour the buttermilk over the flour and gently mix the dough until the dry ingredients are wet (remember, don't overwork the dough). Drop a tablespoon of dough into the soup (I use this tool), one at a time. Bring the soup to a slight boil and cover the soup pot. Cook the dumplings in the soup for 15 minutes. Next week, we’ll resume class with some talk about baking gear and a huge giveaway (you don’t want to miss it). Plus, we’ll break open a new bag of grain and talk about ancient einkorn. Disclosure: This post is sponsored by Bob’s Red Mill. The opinions and photos expressed are completely my own. I’m thrilled to team up with my favorite companies to bring you this fall baking series. 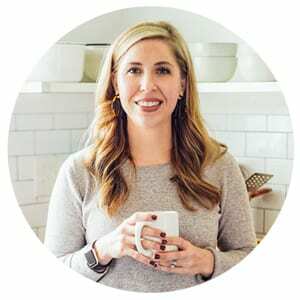 As a blogger, I’m privileged to partner with companies making a difference in the natural and real food world. I only endorse companies and products I 100% love and believe in. Thanks, Medha. Until this past year I really didn’t pay much attention to all the different flours on the market, but now that I know how to use them, it’s made baking so much fun! I mostly stick to gluten free flours these days but always used to use spelt. 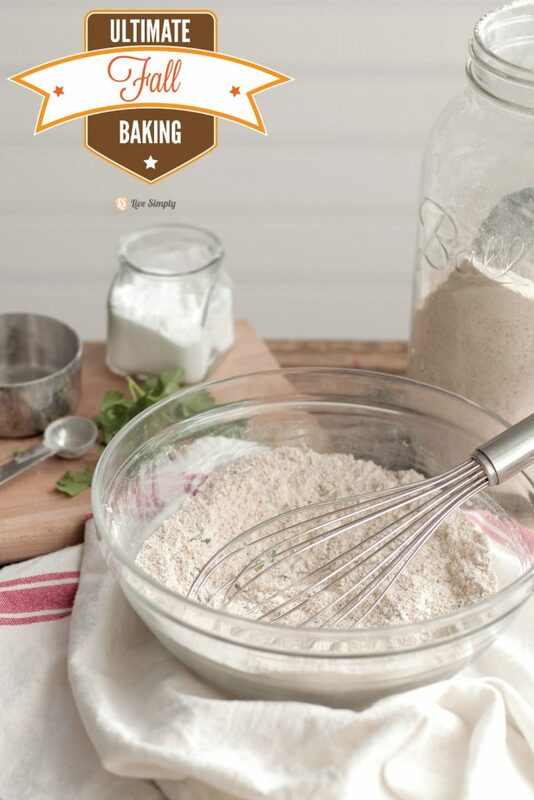 You’re right, it’s fantastic for baking and really easy to use when you have no idea how to use gluten free flours, which can be a challenge! Great soup. Having made this recipe, my jewish wife declared that I make a better chicken soup than her mother! High praise indeed. 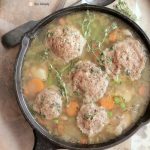 I am new to using spelt and had a craving for chicken and dumplings, so I googled it and came across your amazing recipe. My husband has type 2 diabetes and I am living a Weight Watchers life, so to find your website was a Blessing for us! This chicken and spelt dumpling recipe will definitely be a keeper for us! Thank you! Hey Betsy, I’m so glad you loved the soup and dumplings!